Notes: This is the new higher proof (100 rather than 80) proof the standard 1800 Silver is aged (rested) in primarily American Oak barrels with a small amount of French Oak for about 15 days. Other versions are the 80 proof Silver, the slightly older 1800 Reposado and their older brother1800 Anejo , and some older limited editions we have not been able to review as yet. First Impression: Much more aromatic than its 80 proof brother, sea salt, green peppers, citrus notes and slightly sweet smell. Taste: Sweetish entry, agave sap, slightly thick, waxy mouth feel, pleasantly mineral and herbal dry finish. Seems like more wood influence than the 80 proof version. A touch raw in the finish. Bottle: Rectangular with shaved off edges and squared off shoulders. 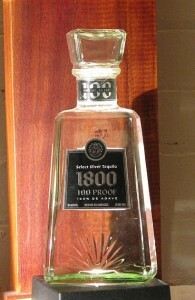 Simple pressed glass design of stylized agave at bottom, paper labels. Squarish glass stopper with cork around glass stem (seals tightly) – an important point with tequila- assuming you are keeping the bottle for a while. Moderately heavy glass large square bottom and short silhouette make it a hard to tip over bottle. Final Thoughts: A drinkable tequila at a cheap price. A bit drier than its 80 proof brother with a lot more bouquet and presence, good choice one for someone on a budget or who is just starting to explore tequila. Think of it as the grown up version of their Silver Tequila. Downside is it is a bit fiery or raw – but sometimes you want that in a Tequila – makes you appreciate what you are potentially doing to yourself and might slow you down.